At Asmech we are proud to have been supplying handling systems and conveyors for over 20 years. During this time, we have been lucky enough to supply and work with companies large and small in a vast range of industries. Our handling systems are efficient, unique, and extremely reliable. We can offer an incredible range of both standard and bespoke conveyors and systems to suit whatever specific requirements customers have. Being able to design, manufacture and install allows us to offer the correct equipment to ensure customer requirements are met. In our blog this week, we’re taking a trip down memory lane, looking through some of the industries we’ve worked with over the past two decades in supplying purpose-built and effective systems. One of the most popular industries we provide equipment for is the Dairy industry. We have had great success working with many industry leaders within this sector to improve their production efficiency and capabilities. One of our most recent projects involved a Cheese Conveyor which we supplied to a leading business within the Dairy industry. The system comprised of two 3m long belts was designed and manufactured to improve their current cheese filling process, and in doing so, changed the methods in which the company operated; leading to fewer operatives on the line (the number of operators reduced from 4 to 2 and ultimately reduced labour costs). The conveyor reduced the reliance on manual operators, being able to handle both full and empty cheese moulds. The conveyor has built-in scales which allows the capability of weighing the cheese moulds, making sure that the filling is accurate and correct. Through this handling system, our customer was able to improve speed of filling product, efficiency, and reduce cost. The food industry is another of our main areas of work, supplying our conveyors and handling systems to many, including a leading provider of crisps and snacks foods. This customer contacted the team at Asmech directly and their brief was for Asmech to manufacture a handling system incorporating an air rinsing facility for their production line. This air rinsing machine was to work within their original system. Its purpose was to remove any unnecessary debris from the base of containers going through; which represented an integral step in the production line, and one that required reliable and cost-efficient solutions. The air rinsing stage is usually the start of any filling process; air rinsing removes dust and other residues from containers allowing the rest of the filling process to be carefree. Our handling system was able to complete this action using side grips which transported and rotated the containers 360-degrees. At Asmech we have long-term customers in the pharmaceutical industry. We have recently successfully provided one of our clients with a new timing belt conveyor system. The timing belt handling system is one of our most popular systems, centrally driven and allowing tight transfers, the construction is simple and limits the need for excessive spare components. This system accepted products from a wrapper and tamper proof machine before delivering the product to a manual packing station. Operators then transfer goods into boxes ready for export. A rare industry for Asmech but it shows just how reliable and versatile our handling systems can be. We were able to provide Mansfield Brick Co. (who operate in the building industry) with a heavy-duty pallet conveyor which we also designed, manufactured and installed. Mansfield Brick produce concrete products for their industry. Our conveyor now easily moves these products around the site. “The pallet conveyor system is very impressive and whilst being designed with the special requirements of the material building industry in mind we have been advised that the heavy-duty construction will also offer long lasting performance with minimal maintenance. “We are extremely happy with the complete package Asmech offered and are pleased to say that our efficiencies since the line was commissioned have increased considerably”. 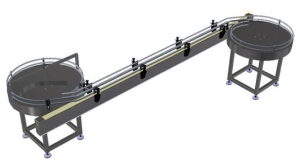 Building on an already close working relationship, we supplied another handling system to a company operating within the beverage industry. We provided a rotary table and conveyor system which integrated into a rotary filler and capping machine. The point of the overall project was to supply a new bottling line. This new line would carry out all the bottling processes. From blowing the bottle, to filling, capping and labelling. An example of the system is below. If you’re currently a business within the above industries, a conveyor system can improve your companies’ productivity and efficiency. Our team at Asmech can make sure you choose the right handling system for any situation. Please call on 01623 424 442 or fill out our Discuss a Project form. Subscribe to Asmech Systems to stay up to date with the latest news and our recent bespoke design solutions.